With an enviable location just across the road from the stunning Stormont Parliament Buildings, La Scala is perfect for light bites and more substantial fayre. As with all of the hotels in the Hastings Hotels Group, the restaurant is big on food provenance and championing local produce. 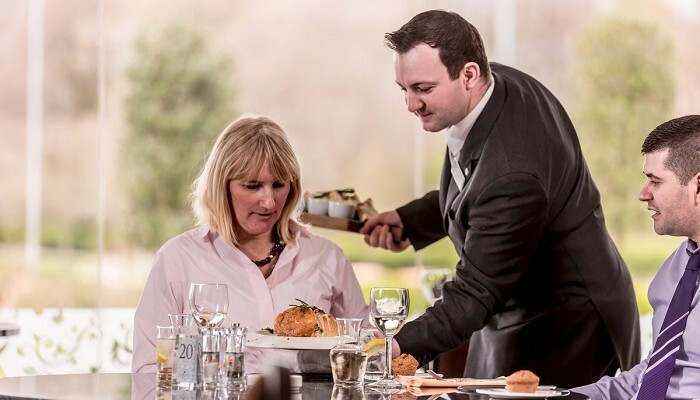 The menu changes frequently but you can expect the likes of a hearty seafood chowder and a delicious classic prawn cocktail made with locally caught Portavogie Prawns. Don’t go past their uniquely yummy Belfast Rarebit. Their version is made with Irwin’s Stout Wheaten topped with Fivemiletown cheddar cheese sauce and Grant’s dry cured bacon. Peter Hannan of the Meat Merchant fame, has his amazing steaks on the main course menu – you can really taste the difference with the Himalayan Salt cured beef. The hotel’s chefs have developed a fantastic range of dishes featuring local produce such as Glenarm Salmon, County Down pork and Armagh Cider apple sauce. Make sure to leave room for dessert and the yummy Jam Jar Sponge served with Glastry Farm Vanilla Ice-cream or the Café au Lait Crème Brûlée with homemade Chocolate dipped Shortbread – yumm!